Make sure you also see my post about Placement. Today I want to focus on Bidding. When you decide to create an ad through the self-serve ad tool, the default bidding is to optimize for whatever action fits your goal. If you’re running an ad to get more Page Likes, Facebook will optimize for that. If you’re promoting a Page post, Facebook will optimize for more engagement. If you’re promoting an external website, Facebook will optimize for clicks. This type of bidding is otherwise known as Optimized CPM (CPM is Cost Per 1,000 Impressions). Facebook will charge a rate per 1,000 impressions, but in this case they’ll optimize by showing the ad to people most likely to perform your desired action. That gives you four options in all: Optimized CPM, optimizing for clicks, CPC and CPM. As with the self-serve ad tool, Facebook defaults to Optimized CPM for all ad options other than when promoting an external website (in which case CPC is used). It would appear that the ability to optimize for clicks is missing here. But we’ll get to that in a minute. In the example above, if you were to put a manual bid on Actions, that action would be for Page Likes. This is where things get crazy. I know it’s a lot to take in. But follow me because it’s worth it! 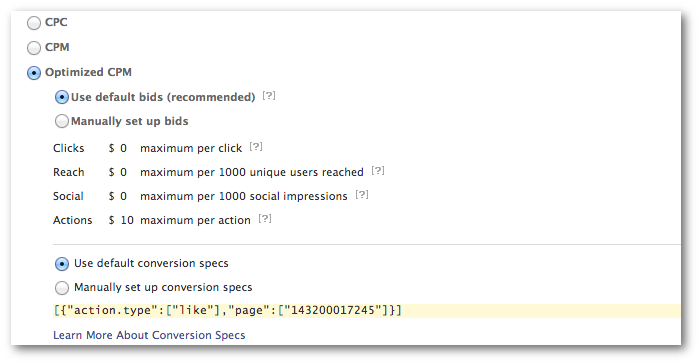 A Conversion Spec is Facebook automatically optimizing your bid for a specific action. In the case of a promoted Page post, Facebook will use Conversion Specs to optimize for engagement. As I said, this is where things get crazy. It’s also where advanced Facebook marketers make their money. And it’s where amateur to intermediate Facebook marketers get lost and rely on the default settings. “Engagement” is any click within your ad. Is that what you want? It depends on your goals. Maybe you want shares. Or link clicks to your website. Or video plays. Or something else. Now imagine that you combine Conversion Specs with Conversion Tracking — optimizing for a sale or some other website conversion. 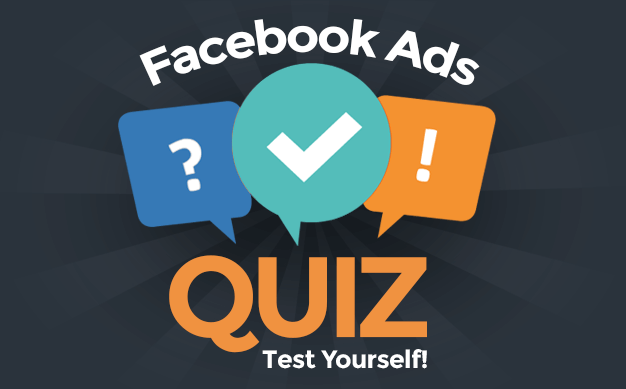 Facebook advertising just got a whole lot more powerful! Of course, these things are not available within the self-serve ad tool. They are only found within Power Editor and certain third party tools that utilize the Facebook ads API. If you’re only using the self-serve ad tool, you’re skating by on the basics. You’re using the defaults and very little beyond them. If you use Power Editor, you take full control over your bidding. Which are you using?